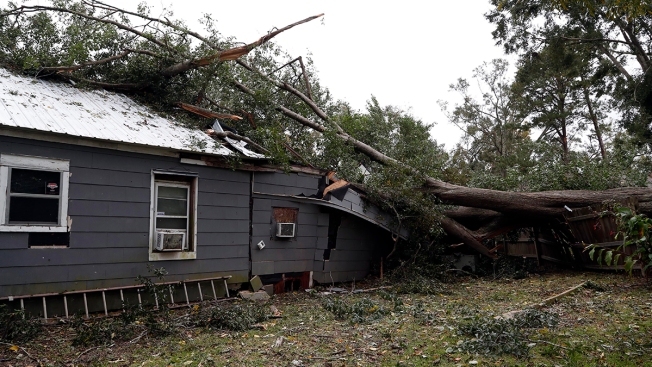 This fallen oak tree heavily damaged the home of Jennifer Lyles in Natchez, Miss., after a tornado hit early Thursday, Nov. 1, 2018. At least 11 tornadoes have been confirmed by National Weather Service surveyors so far in Louisiana and Mississippi as part of a storm system that moved across the region Wednesday night and Thursday. Forecasters said most of the East Coast was at risk for severe weather Friday, with winds as strong as 60 mph, isolated tornadoes and heavy rain possible as the Gulf Coast recovered from storms blamed for two deaths. "I think people are not wanting to see more wind and rain," said Mayor Margo Anderson of hurricane-tossed Lynn Haven, Florida. "It puts everyone on edge. It's frightening." The Storm Prediction Center said there was a marginal risk for severe thunderstorms along a line running from Florida's west coast to southern New Hampshire in New England. About 64 million people in cities including Washington, Philadelphia and New York live in the path. At least two deaths along the Gulf Coast were blamed on storms that hit Wednesday night and Thursday. At least 12 tornadoes had been confirmed in Louisiana, Mississippi and Alabama, with the damage surveys expected to continue Friday. Panama City spokeswoman Caitlin Lawrence said the storm system moving east through the Florida Panhandle on Thursday was the second significant rainfall the area has had since Michael hit on Oct. 10. "We did have one really rainy and windy day last week," she said. Officials are concerned about heavy rain and any structures that have already been damaged, as well as loose tree limbs being toppled by strong wind or rain, Lawrence said. 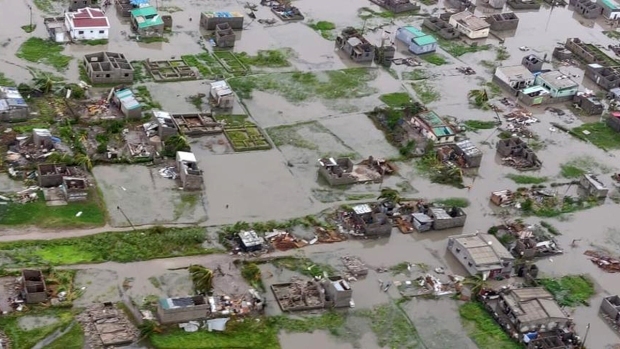 Hundreds of homes protected only by flimsy tarps were particularly vulnerable. In Mississippi, the Department of Public Safety said Alcorn State University student Jayla A. Gray, 19, of Jackson died early Thursday when the car in which she was a passenger struck a tree that had fallen across a highway near the town of Port Gibson, which is about 60 miles (97 kilometers) southwest of the capital of Jackson. In Louisiana, a pair of twisters with top winds of 115 mph (185 kph) hit Washington Parish, north of New Orleans. Near Bogalusa, a mobile home rolled over, injuring two occupants. Two weaker tornadoes were also confirmed in and around Lake Charles, including one that damaged a vacant shopping center near McNeese State University. In northwest Alabama, surveyors said a weak tornado with top winds of 65 mph (105 kph) caused tree damage near the Franklin County crossroads of Pogo.